I’ve been meaning to blog more about some of the great books I’ve read this year. Some of them are kind of obscure and I feel the need to share them. One of those fabulous books is The Curve of Time by M. Wylie Blanchet. This was a book club selection for the Women’s book club at the library. I had never heard of it before. I’m so glad I was introduced to it. It’s a beautiful book. It is considered a memoir but I think travelogue is a more accurate description. 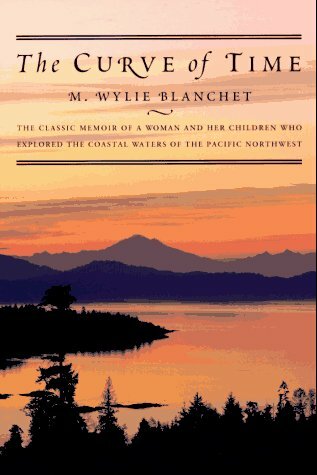 It is written by M. Wylie Blanchet, whose husband died unexpectedly leaving her with five young children. Not a lot of detail is given about the death of her husband. The “About the Author” section states that he was “presumed dead when he never returned from a day trip on the Caprice.” The boat was found and then became the scene for the stories in this book. The stories take place in the 1920s an 1930s. I find that remarkable. I’m not sure why. Maybe it’s because she was a single mom during that time period. Maybe it’s because she wasn’t afraid to go out and have adventures on a boat with her kids. Wasn’t afraid to even get into some perilous situations. I like that she didn’t depend on the help of a man to fix the boat if it needed fixing. She was self sufficient and was able to handle the work herself. Was this rare for the 20s and 30s? I have this idea that it was. Regardless, she was a remarkable woman, even by today’s standards. I wouldn’t know the first thing about fixing a boat. And going on adventures where I could potentially be attacked by a bear? Forget about it. As I was reading this book I searched for a map of the islands around Vancouver Island so I could see where all of the islands and inlets were that she was talking about. I felt pulled into the stories and I found myself wanting to visit the area to see the places she writes about. But it’s not just the places that make the book so wonderful. It is the characters she meets, as well. People and animals. As I was reading this I couldn’t help but think of my great-grandmother, Laura Boucher. It was probably around the same time period, maybe a decade earlier that she went through something sort of similar. My great grandfather, Will Boucher moved her and their five (or six?) children up to Vancouver, B.C. so he could find work (doing what I can’t remember). My great -grandfather died on one of those small islands up there while hunting. He was shot accidentally by his hunting partner. He was only in his thirties when he died and he left my great-grandmother with their five young children, a widowed and a single parent. I always imagined mysterious circumstances surrounding the death of my great-grandfather. Was it really an accident? Maybe it was a murder? But that is all speculation. The result of reading too many murder mysteries. My great-great grandfather, Laura Boucher’s dad (Ben Boucher) went up to Vancouver to help her move back down to Couer d’Alene, Idaho, where the family was originally from. And that is where she lived until she died. She never remarried. Anyway, back to the book. It was one of my favorites so far this year. I highly recommend it. I wish I could be a bit more descriptive but I’m afraid I would spoil the wonderful stories if I did. However, if you are in the mood for a well-written memoir from a phenomenal woman, as well as a travelogue that will allow your mind to drift away to an amazingly beautiful place, you should get your hands on it. Sounds really interesting. I may have to get my hands on that in the future.